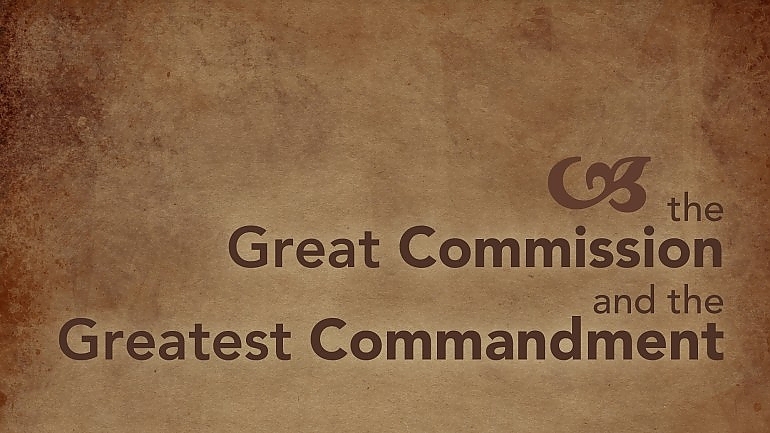 Great Commandment or Great Commission? Is the church there primarily to serve me, or I am there to serve the church? Does the church primarily serve its members, or its members serve the community? Is the church there to love people inside and outside the church or is the church there to advance the mission of the church? The answer to the last question is ‘yes’. Followers of Christ are to be concerned about the Great Commandment and the Great Commission. Both are Scriptural commands and summarize much of what it means to follow Christ. At points in history Christians have tried to separate these two out as it relates to carrying out the ministry of the local church. In fact, more left leaning Christians were heavily engaged in addressing poverty, social issues, and matters of justice. More right leaning Christians were engaged in various forms of evangelism, such as crusades, tract distribution, and street witnessing. Some expressed love by doing ‘mission’ efforts. Other expressed love by ‘evangelism’. While there are some reasons for this, the dichotomy is not found in Scripture. Wisdom requires that the Great Commandment and the Great Commission be intimately connected. It is impossible to fully do the Great Commandment without doing the Great Commission. Equally so, if we seek to carry out the Great Commission without regard for the Great Commandment, we fall woefully short as well. As Pastor Harold Bullock of Hope Church in Ft. Worth notes, one sets the boundary and the other sets the priority of ministry. One’s education, societal upbringing, church and neighborhood culture, spiritual mentors and influencers, and a host of other things impact our perspective of the gospel and what it means to follow Christ. For some believers, they are deeply engaged in loving and caring for people as their spiritual service. They emphasize the doing of good deeds and are passionately invested in doing so. Others however, emphasize the telling of the Good News as their primary method of spiritual service. They too are passionate. God gave us the command to love Him with all of our hearts and minds, and love our neighbors as ourselves before He gave us a commission to make disciples of all the nations. It is impossible to do the acts of service or acts of mission without these important two boundaries. First, the boundary of doing nothing that violates our loving relationship with God. Second, the boundary of doing no ministry, no mission effort, and nothing for God that violates the boundary of loving people in accordance to specific commands and principles from God’s Word. God also instructed to not only love people around physical, emotional and relational needs, He commanded us to go and make disciples of all the nations, baptizing them and teaching them to obey God’s Word. The love of Christ compels us to help people come to know and follow Jesus Christ. It is impossible to love a person completely, and not actively share Jesus with them. The Great Commission sets the priority of our ministries. America tends to be a results-oriented people. People want to see a return on their investment of time, money, and other investments, and too often take unbiblical short-cuts to get the results. The potential danger for those wired naturally toward the Great Commission is forgetting the boundaries of love. Therefore, all forms of trickery, coercion, manipulation, and guile are all outside the will of God. These things violate and step outside the boundary of loving our neighbor as ourselves. We have to really love people and do right by them according to the Bible in order to stay inside the boundaries that God set for us. We cannot just do whatever we deem is best, or feels right to us, or fits the chosen ethic of the moment. All too often our evangelistic efforts fall flat as we seek to evangelize strangers, because we have not done the hard work of loving well those who know us best. We have to live with integrity, humility in our short-comings, and take steps to clear up relationships when there is conflict in order to effectively share the gospel with those closest to us, like family, friends, and co-workers. The boundary of the Great Commandment and the priority of Great Commission are inseparably connected Biblically and hopefully practically in the church as well. Regardless of intentions and the desired objectives, the End does not justify the Means because God said so. God’s work must be done God’s way or it is not God’s will. This is true for individuals, churches, and denominational leaders as well. Is your life, church or ministry both specifically committed to both the Greatest Commandment and the Great Commission? Do you need some assistance developing a workable Great Commission strategy? If so, I can help you. Contact me.